Smash Brothers Amiibo Set . All 58! Here is a handmade Wall or Shelf display for Nintendo Amiibo. Display your amiibo easily and Keep them personally organized. The shelves have holes drilled down inside them for the amiibo to sit in. They will not simply be on a shelve where they can fall off. They will be securely set in the shelf so the figure is flush. Most cases keep your amiibo behind glass or in a case which makes their access and availability limited. With my stands and wall displays, your amiibo are easily accessible to be what they are meant for; played with. You can simply take one out and play smash with it and it can easily go back in its designated slot after use. These shelves are very lightweight and can easily be mounted with simple double sided tape. If you want to be super secure, you can get wall brackets but as you can see in the picture of my room, the small stands don't need them. I just mounted mine with the tape. All stands are handmade. Holes are hand drilled. Wood is hand sanded and painted. The default color of these stands will be shipped in black. If you want them white, add the variant and I can do that for you for only $5 more. These stands measure in length 20" for the five amiibo stands, 16" for the four amiibo stands or 12" for the three amiibo stands. They are all 6 3/4" Tall. These stands can be customized. You can choose the amiibo print and the position on the stand where you want them. When you order make sure to leave a note and telling me your preferences on which amiibos you want on your stand and their position. You can send me a message if you have any questions. With each purchase you will receive 16 total shelves. (Due to shipping rates and complications, I no longer ship the 6 or 7 amiibo stands. They were too large so they're broken up into two 3 amiibo stand(for the 6) and a 4 and 3 amiibo stand (for the 7) . (Famicom R.O.B, and Player 2 variants can be purchased as well for extra cost- Message me for addons) If you are looking for the Smash Ultimate line, I have a separate listing for those. Check my others to purchase that 18 slots set :) I also sell a full Ultimate smash set which holds all 75 , you can find that one in my other listings as well. 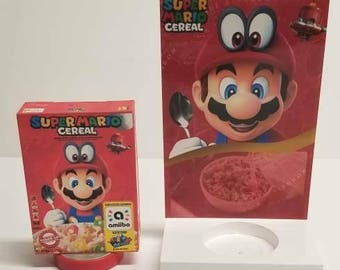 AMIIBO NOT INCLUDED!!! You get the wood base and pictures of the amiibo premounted. Super Mario Brothers Amiibo Stands/ Wall Display All 17!! Smash Brothers Amiibo Set . 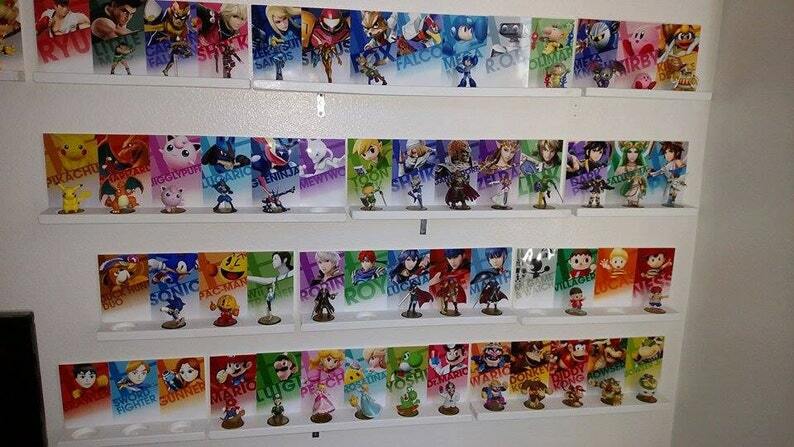 All 58 Smash Amiibo Wall Display/Stands/ Mount FREE SHIPPING! All DLC Included! Shipped a little late and had a few minor nicks when it arrived, but overall a good quality product. Will still most likely return and would recommend this company/product. Everything was exactly as specified. Great work. It did take longer than expected, but worth it! Beautiful hand crafted quality. Perfect for storing amigos. They even have a little wiggle room so it doesnt all fall if a kid grabs an amiibo for their game! Thank you so much for a wonderful product <3 I'd post more pictures, but etsy mobile doesnt allow it. Here's my two sisters though!